Photo: Street Scene, Danville Commercial District, Danville, KY. The Historic District was listed on the National Register of Historic Places in 1986. Photographed by User:Russell & Sydney Poore (own work), 2007, [cc-by-3.0 (creativecommons.org/licenses/by/3.0)], via Wikimedia Commons, accessed January, 2016. Boyle County administrative offices are located at 321 West Main Street, Danville, KY 40422; phone: 859-238-1100. 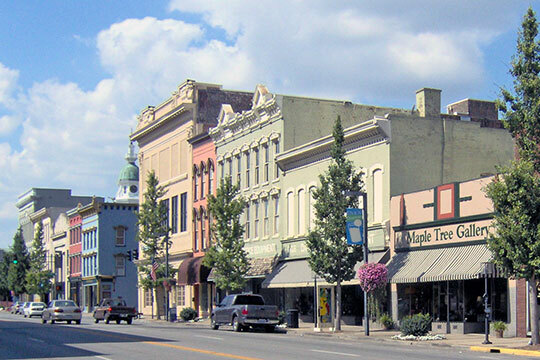 Boyle County  was formed from portions of Lincoln and Mercer Counties in 1842. Boyle County was named for Judge John Boyle (1774-1834), the Chief Justice of the Kentucky Court of Appeals. The county is bordered by Mercer, Washington, Marion, Casey, Lincoln, and Garrard Counties. Covering 182 square miles, the majority of its territory is classified as part of the Bluegrass Region except for the area southwest of Danville which is in the Knobs. Major waterways include the Dix River, Salt River, and the Chaplin River. Helen Powell, H. Powell & Company, Inc., Multiple Resource Area of Danville, Kentucky, nomination document, 1986, National Park Service, National Register of Historic Places, Washington, D.C., accessed January, 2016.